This lovely apartment is just a few steps from the beach, Farme de Amoedo and everything that counts! It has been completely remodelled and started to be rented recently. It is on the 6th floor of a residential building, just a short walk away from the most beautiful beaches in Rio de Janeiro. The Sunday Hippie Fair is just around the corner and lively Farme de Amoedo is a few blocks away. Its location is ideal as you are close to the metro stop in Ipanema. It is tastefully decorated with designer furniture and boasts a spacious living room, a fully equipped kitchen and a comfortable bedroom. The large and beautiful bathroom has a double shower. The apartment is equipped with all new amenities such led TV, i-pod docks, air conditioning, etc. Make of this beautiful apartment your home away from home! Really great apartment in Rio!! I stayed in this apartment for about 10 days and the pictures didn't lie, this is in fact a very nice and comfortable place!!. Location is also very great, with Ipanema beach just a couple of blocks away, restaurants, coffee places all around and Plaza Osorio metro station around the corner (which I used to move very safely/reliably around Rio). The Sunday market in Plaza Osorio was also very nice. Additionally to Rio, I complemented my stay with a two day visit to Ilha Grande (which I also recommend very much) and Joana was very helpful providing information and contacts for transfers to and from the Island. Both, Franco and Joana were on top of all my inquiries and provided an excellent customer support. I for sure would stay in this place again if I have the opportunity! Obrigado!! I am really glad you enjoyed your stay. I look forward to your next visit to Rio!! Great experience from booking to check-out. My wife and I had a enjoyable stay at Franco's newly renovated and nicely appointed apartment. It is bright, clean, and in a very safe neighbourhood. Good restaurants, Ipanema Beach, groceries, and public transport are all within a radius of 10 minutes walk. Dealing with Franco and his rep in Rio, David, was a pleasant experience. They are responsive, accommodating, and professional. 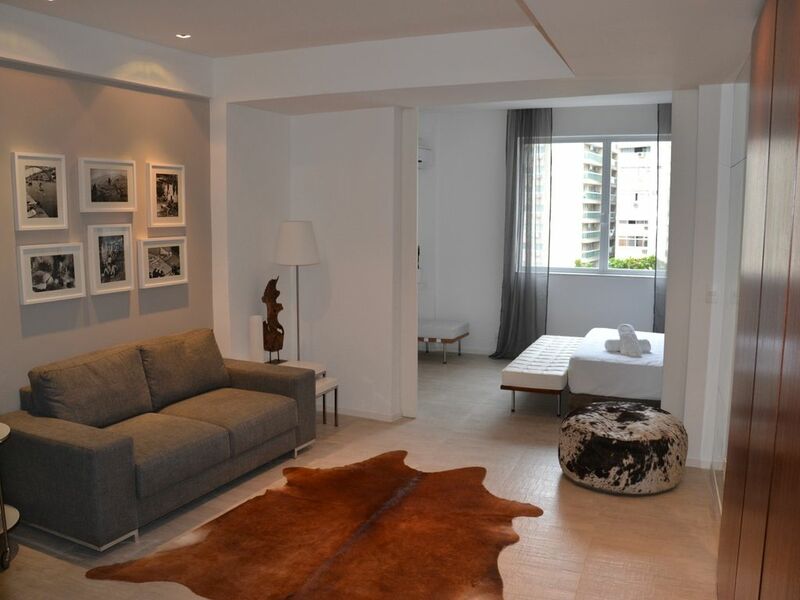 I will recommend the apartment to friends who are planning to visit Rio for the World Cup. It was really nice to have your wife and you as guests in my apartment. I look forward to your next stay in Rio! O apartamento é ótimo e a nossa estadia nele foi maravilhosa! É super bem equipado, as toalhas e roupa de cama são macias e tudo estava limpo e organizado quando chegamos! Franco foi super atencioso. Só temos boas lembranças da nossa viagem. Obrigado, Fabrizio! Welcoming, cosy and tasteful lodging! Highly recommendable. Exceptional for a couple, but admits also 2 or 3 children. A 3-block walk from the beach. Safe area, and classy neighbourhood. Ipanema offers a large variety of shops and service facilities. Everything you may need is handy! Buses run down the street and take you everywhere. I am so glad you enjoyed your stay in Rio and hope to have you back soon. Certainly this flat has been outfitted by a person with great taste, but equally importantly, it functioned VERY well (wi-fi, music, TV, showers hot with great pressure, comfortable seating & bed, cotton sheets, usable kitchen with proper cooking tools) Building has 24 hour doorman so very secure, and property managers are in building next door so accessible for questions. Location is superb, short walks to both Ipanema and Copacabana beaches, 2 blocks from the Ipanema Metro station (especially during holidays, the easiest way to travel, very simple to negotiate). Most immediate things a visitor needs: grocery, drugstore, money change, restaurant, bars, etc. are literally within a block. The owner could not have been more gracious to do business with. This rental was completely easy and operated flawlessly. I had the opportunity to rent this stunning apartment for 3 weeks. It is very rare and difficult in Rio to find well furnished and good conditioned apartments - this place was a gem. The pictures are a very accurate and reflect the modern facilities inside the unit. The apartment and location is quite beautiful – high above normal Rio standards. The landlord of the unit was very hospitable and easy to communicate with. I often must come back to RIO for work, so I would love to rent the apartment again in the future. I would recommend this place to my friends and family. I am really happy you enjoyed my place and look forward to your next stay! Ipanema attracts a large number of tourists and locals thanks to its beautiful beaches, nice restaurants and bar and quiet atmosphere. It is home of the world's famous Sunday Hippie Fair, of the Garota the Ipanema, and countless attractions. ONE WEEK DURING CARNIVAL OR NEW YEAR'S EVE: € 3,000.00 (ANY EXTRA NIGHT € 200).